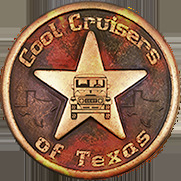 Movie Cruiser... "Chuck Norris Film"
Tom Pennington Built... "Memorial Day Run"
Trail Article by Nolen Grogan... "Cruise Moab 2001"
Article by Butch Baker... "MNToy 4x4 Club @ Kemper Run "
Trail Article by Nolen Grogan... "Cruising, East Texas Style"
Tech Article by Guy Larabie... "Combining 3-F & 2-F"
Trail Article by Jeff Zepp... "Moab in the Fall"
Trail Article by Nolen Grogan... "13 Missed Calls"
Tech Article by Ryan Flowers... "FJ-55 Brake Job"
"Great place to experience the traction associated with slickrock"
As I said before, those muddy hills were quite challenging. "Sometimes, people know when it is time to quit while they are ahead". "The carnage count was pretty much even, one J*#p and one Cruiser left on trailers and the rest went home in one piece". Our first stop of the morning was a small backcountry campground called the Devil’s Kitchen.